The past few weeks had been intensive research on which direction to head for. For me, I strongly believe in the potential of electrochromic properties, therefore, I decided to proceed with an in depth research on electrochromic. The current applications are smart glasses and windows. However, my project mate, Andrea indicated to me that we are not chemists and therefore, to do these layers are pretty impossible at our level and that we should use existing materials to incorporate into fabric. Personally, I feel that without professional expertise, the resulting material will not function properly. Henceforth, I proceeded to find out more ways in which electrochromic properties can be used. I finally found a lab in Institute of Materials Science, University of Connecticut (what we are doing is really material Science now!). Dr Greg Sotzig has invented a type of thread made of electrochromic polymer. Another thing is that conductive yarns can be used instead of normal metal wires. 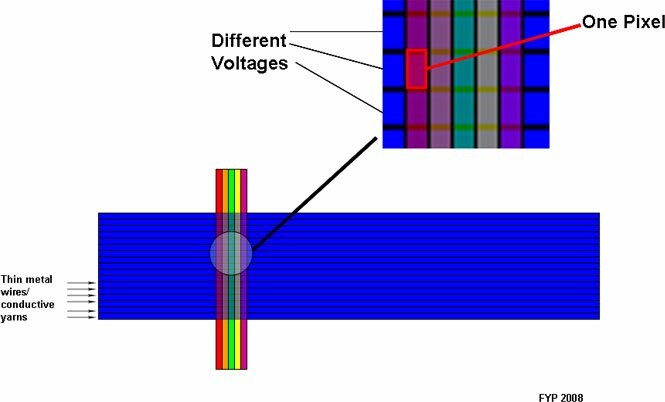 2) Novonic - to enquire about their Novonic Data Cables and also Novonic Heat Cables for Andrea for her thermochromic research. For me personally I feel that there is so much potential to tap on electrochromic materials. Therefore, it is likely that I would like to experiment with the above visualization first and exploring what it can achieve. Currently, the threads are however limited in their colour change as researched by Dr Greg. However, I believe in making do with what technology with have currently and making a breakthrough with them. Wii for example, was created based on technology which have existed for years and it was the concept and wise applications of the technologies available to them that created a revolutionary product.